Use TB1EQBC to reference this item. This coin has been released as part of the Bike Awareness Project. It is a project initiated by USA geocacher Rockin Roddy in response to the death of his dear friend and caching companion Tod Phillips who was cut off by a left turning vehicle too much in a hurry to notice oncoming traffic. Tod died on August 12, 2008. Tod left behind a wife and two kids. At this moment there are travelling nearly 900 coins to help being aware of the more vulnerable travic participants. Besides bikers those are also scooter drivers and ofcours cyclists. The project is about what you can do to start the discussion to get travic a little saver. 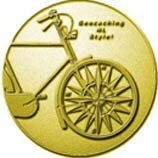 The goal of this coin is to spread the message of Bike Awareness while travelling from cache to cache. Travel to the USA and end up in one of the caches of Rockin Roddy, who then can retrieve and adopt this coin. Cycling (In Holland) With an average of 750 kilometres per person per year, the Netherlands can be called a cycling nation indeed. 7,5% of all travelled kilometres are done by cycling. Inside Europe there is only more cycling done in Denmark. The bicycle is especially important for the High school youth. They cycle about 52% of all their travel-moves. Most accidents happen in residential quarters and cyclist are hit by cars. Most victims are between the age of 12 and 17 and people over 55.In 2007 there were 444 people killed in travic accidents. 198 of them were cyclists. Between 3000 and 4000 people ended up in Hospital. Although the Netherlands are considered a save country this is far too much. Even more because a lot of the victims are children. Two of the reasons of accidents with cyclists are the clowning around the travic and the lack of working lights on the bike. On the other hand drivers do not watch their mirrors enough and they don’t hold in account that children are just children, in travic too. I call upon: All Adult Cyclists; to give a good example. Get a working light on your bicycle and stop clowning around while cycling. And watch your children All Drivers; Not to speed through residential quarters, to be alert and to watch your mirrors.